Posted by rawkfistmusic in 2009, Blue October. I’ll admit right now that I’ve never listened to Blue October, at least not beyond the band’s recent success in their single “Hate Me.” I couldn’t help but be intrigued however, by the roughly pieced ballad with growling vocals and when word traveled to me that a new Blue October album was springing it’s way towards me, I decided it was time to give this band a shot. The results are certainly fascinating, and definitely against what the album title will have you believe. As much as Blue October may want us to think so, they are not anywhere close to Approaching Normal with this effort. That is not necessarily a bad thing however. “Weight of the World” strikes me as an odd album opener every time I listen to it, but after listening to Approaching Normal enough times, I’ve accepted there’s few other choices. This is the song that’ll get you used to Justin Furstenfeld’s unconventional vocals, a mixture of singing and ranting in a generally rough demeanor. Those used to the clean and crisp vocals of other bands may have to take some time to get used to this, which sounds as though Furstenfeld’s been swallowing rocks since he was born. It kind of fits the band style though, a real 90’s vibe which mixes light alternative with grudge influence to make for a fascinating sound. “Weight of the World” won’t grip you though, despite a strong lyrical showing, which I assume is why “Say It” follows closely after. The aforementioned carries over more of the rant/sing style but has a damn catchy chorus which’ll you have singing along by it’s second go-round. It’s not commonplace on this album to have something so deliciously addictive, but it’s hard not to get caught up in the repeteating chants of “I don’t want to hear you say say say say say say say say it, now you’re messing with my pride,” and the raw emotion shown in some of the other parts of the song. Don’t get used to it though, Blue October’s newest effort is a mixed bag and every song has it’s own personality. Lead single “Dirt Room” is a little more upbeat in style and uses a great drum beat to pull you in to more lyrical twists and turns. Writing is Blue October’s strongest suit and it’s showing in grand style throughout the entire CD. A lot of it’s angsty, so it’ll be great for the grunge enthusiasts still weeping over the late Cobains and Staley’s of the world. There’s not a bunch more to comment on here, individually speaking. 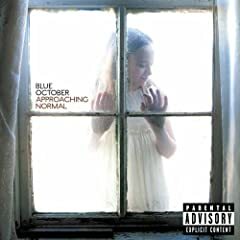 Nearly every song on Blue October’s endeavor into “normality” is completely different than the one before it, making this not so much of a cohesive effort, but more of a collection of interesting songs. “Been Down” has some pretty catchy moments for those who fell in love with “Say It,” though the chorus packs more of an emotional punch to be sure. “Kangaroo Cry” is an oddball in title, but doesn’t really stand out otherwise, as one of the weaker efforts on the album. Not a bad thing necessarily, it’s still very listenable, it just won’t be coming back to you as much as the others. “Jump Rope” is the biggest problem on the album. The strings arrangement that follows the track is incredibly strange and the overall sound of the song seems so out of place on this relatively downbeat collection. I almost broke out laughing when Furstenfeld enthusiastically sings “Up down, up down, up down….life’s like a jump rope.” The metaphor there might be worth paying attention to, but it sounds so absurd it’s really hard to enjoy the track at all. Instrumentally speaking, Blue October’s not very special on anything. It’s rare to notice anything outside of those trademark vocals, but everything the band does works cohesively. Never does anything seem too out of place (except on “Jump Rope”) and every song really fits together well. Arguably the best track is one you’ll get with the explicit version only, the bonus effort “The End.” Strongly reminiscent of Eminem’s classic “Kim” or the more genre-related “A Little Piece of Heaven” of Avenged Sevenfold fame, the song reeks of violent revenge on a loved one. It’s a little insane, it might scare some people, and it might get a minority of those people really pissed off at Blue October, but the raw passion and emotion of the song will chill anyone who listens. Really, that’s what Blue October does best throughout all of Approaching Normal, and I won’t be one to fault them for it. There’s not a lot about the album that’ll jump at you, but it’s work sticking around for a few listens to see if it’s your cup of tea. Blue October has a new video for “Say It” that has me so excited for their concert in San Jose this August. I found a pretty good link at http://bit.ly/BlueOctSayIt. Let me know if you like it or if I’m just crazy.